Being a student at Washington College, I was recently privy to a talk on George Washington and the lessons he can teach us about effective leadership. The talk was chaired by the Executive Director of Mt. Vernon, James C. Rees. 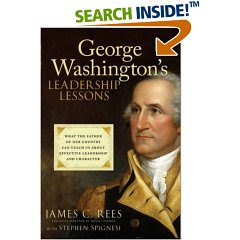 The talk focused on the subject of his book: "George Washington's Leadership Lessons". The talk was very good, focusing on Washington's character, saying that character was the key to good leadership. However, Mr. Rees only had 45 minutes to cover all elements of his book, and therefore it was a very general presentation on Washington's character. However, the talk was good enough that I bought a copy of the book after the lecture. At only 181 pages, it is a quick read, and like the talk itself, it is very general and to the point. Mr. Rees spoke of the length, saying his publisher wanted it "Short enough that [a traveller] could pick it up at the airport, and finish reading it by the time he touched down at his destination". Yet, despite this, it provides an excellent overview on the successful character traits for leadership. Although not as sweeping or elegant as David McCullough's "1776", the quick and to the point style allows it to be enjoyed as a 'primer' to the Father of our country for those who are only beginning to learn about Washington. The style also lends itself well to young adults, and could serve well as a supplement to our Cadet Program as another way to teach the important aspects of leadership. For seniors, much of what it says can also be found in the AFAIDL 00013, and yet when I read the same here, I found that it makes much more sense. Overall, a recommended read for both Cadets and Seniors alike. Rescuemen? or a Flying Club?